George Clinton, Still Radiating the Funk If James Brown is the Godfather of Soul, George Clinton is the Crown Prince of Funk. Now past retirement age, the ringleader of Parliament and Funkadelic continues to inspire new generations. Explore a series of first-person radio stories on the creative lives of a variety of musicians. George Clinton says he draws inspiration from his days in the '60s as a Motown songwriter. In this interview excerpt, he describes working with Parliament band mates Bootsy Collins and Bernie Worrell to create the funk classic "Flash Light." George Clinton, aka Dr. Funkenstein. I had to ad lib a lot of it. The track was atomic. It's a futurist track... I don't still hear no tracks like that one. If James Brown is the Godfather of Soul, George Clinton is the Crown Prince of Funk. He's the ringleader of Parliament and Funkadelic. Their shows in the '70s featured an apparition called The Mothership. 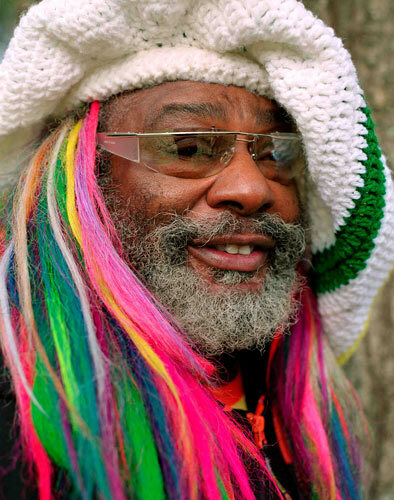 George Clinton hasn't had a hit in years. As he likes to say, though, funk is the DNA for rap. Tunes like "Atomic Dog" have been sampled over and over. His music is recycled on records by Public Enemy, Ice Cube and Snoop Dogg. "Psychoalphadiscobetabioaqua- doloop — the art of dancin' underwater and not gettin' wet. That'd be my job..."
Clinton recalls the unlikely way his early '80s hit "Atomic Dog" ("This is the story of a famous dog, about a dog that chases its tail...") came together in the studio, thanks to a backward-tape machine, overlaid drums and puzzled engineers that let it all go down. "I just had the word 'dog,'" Clinton says. "That's all I had in my mind. I had to ad lib a lot of it. The track was atomic. It's a futurist track... I don't still hear no tracks like that one." Clinton, in his mid-60s, still tours with a band of almost 30 people, most in outlandish costumes. He says it's a waste of time trying to analyze what the band is up to. "Can't even count us," he says. Stage props over the years have included a huge denim hat, and a gigantic puppet that wore a baseball glove and tapped its foot. Clinton says the roadies got tired of dealing with the puppet, though, and ditched it somewhere along I-95. Clinton's pervasive influence on today's pop music isn't limited to rap. He produced an early record by the Red Hot Chili Peppers, Freaky Styley. Much of that record was made at Clinton's house in Michigan. Features in this series are produced by David Schulman and NPR's Jeffrey Freymann-Weyr. How Late Do You Have 2BB4UR Absent?